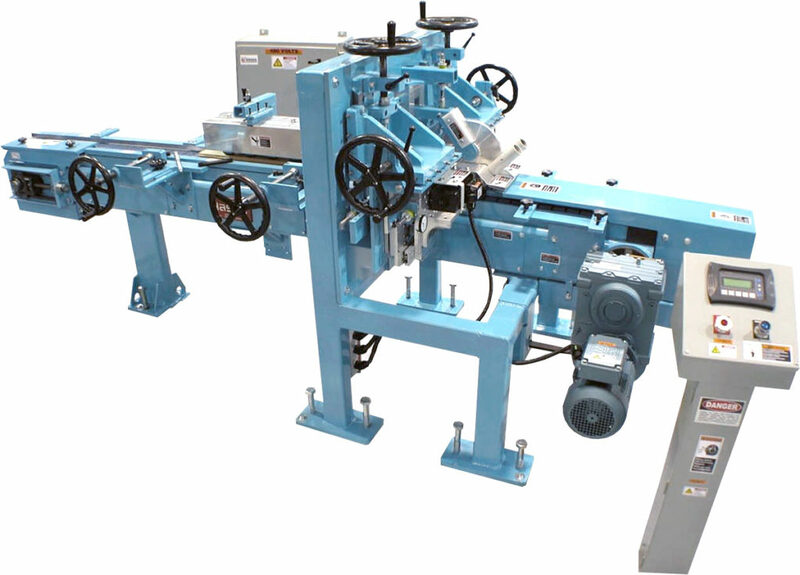 This machine was designed for machining a face-edge bevel or micro-bevel on unfinished square-edge strip flooring. Its unique, high-speed, opposed-head configuration maintains consistently accurate bevels on typically twisted and bowed strip flooring. Its stand-alone design enables manufacturers to upgrade previously designated inventories of unfinished square-edged strip without disrupting production in a minimal amount of floor space. The HSSB enables manufacturers to upgrade inventory of unfinished square-edge strip flooring by machining a face-edge bevel or micro-bevel and adjusts from 2-1/4″ to 5-1/4″ face width. Hasko Model HSSB High Speed Beveling Machine (U.S. Patent No. 7,070,370) for Strip Flooring. This Machine was designed for those that wish to machine a “face edge” bevel or micro-bevel on unfinished “square edge” strip flooring. Typically this beveled product would be run through a finish line as beveled pre-finished flooring. This machine allows manufactures to re-run flooring from inventory that was previously designated as unfinished flooring stock. The Hasko HSSB incorporates a unique, high-speed opposed head configuration that references the face and face-edge of flooring. This design provides for very consistent and accurate bevel and micro-bevel machining on typically twisted and bowed strip flooring.